The 8-inch-square, plastic Fixed Base is permanently glued to concrete or asphalt. Estimated Post or Bollard removal/install time with an Allen Wrench is 2 minutes. 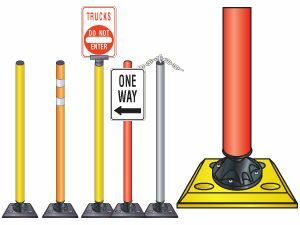 48 inch Gorilla Post Fixed Base delineator rests on a sturdy, 8-inch-square, plastic base with a 1 inch thickness. Four bolts tighten down with an Allen Wrench to secure the GorillaPost to the base. 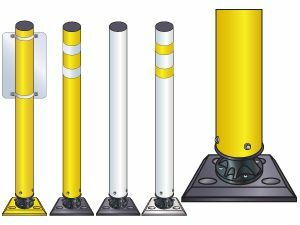 Our 4 inch diameter bollard temporarily folds over upon impact offering excellent delineation across emergency access points to campuses and venues, and are more conspicuous than standard delineators and raise driver awareness. 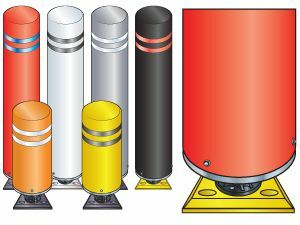 These 7 inch diameter Gorilla Post Fixed Base Bollards attaches to a permanent base, folds over upon impact and returns to an upright position. Available in 48 and 24 inch heights.